In 2013 and 2014 I had reduced my work as an international conductor as I wanted to write a large work. 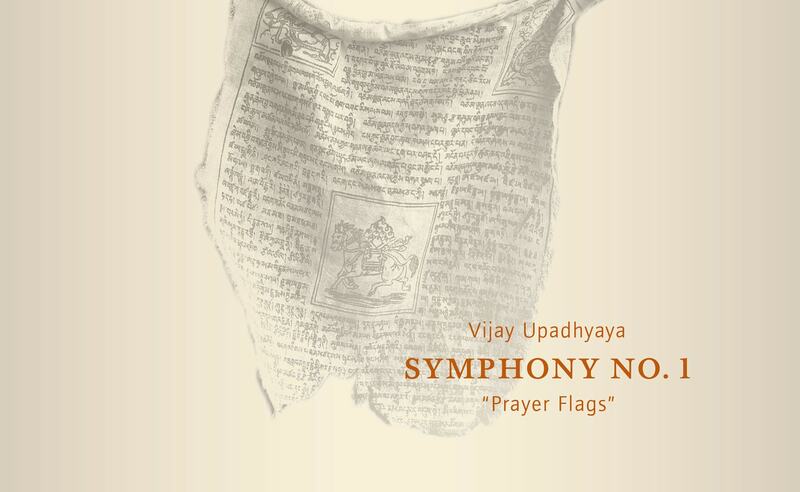 This first symphony “Prayer Flags” I completed in July 2014 and was premiered on 11th December 2014 in Vienna. This is a work for large orchestra, a 4-8 part mixed choir, a 3 part female choir and five soloists. The total duration is about 70 minutes. The work has four movements, combining languages and philosophy of the Indian Middle Ages, Indian rhythms and melody sequences with Western symphonic music. The texts are of three poets from mediaeval India — Kabir, Amir Khusro and Meerabai as well as a a famous text from the Upanishads. Mysticism in Indian poetry reached its peak with the Bhakti cult of Sufism between 1200 and 1500 AD and advocates a complete surrender to god. The musical content is freely tonal and the soloists are required to sing with both western and oriental vocal techniques. The melodic patterns are pentatonic or irregular hexatonic scales in most cases. In order to reveal how regressive some present day societies have evolved, the image of the woman in medieval India has been especially highlighted depicting the liberal thought of this age. The first movement “Shakti” represents prayer flags and the forces of nature. According to Buddhist tradition, the prayers on a flag are carried by the sun, rain and wind to God. Nature in its original magnificence and power is called "Shakti" in Indian tradition and is a female personification. The hexatonic scale uses C♯, G♯, D♯ and A♯ — this scale is often used in the ritual music of Tibetan Buddhism. The second movement sets the poetry of “Kabir” (1440–1520) and of the Upanishads to music. The Upanishads urge the human to seek the truth, leave darkness and seek light which will lead to spiritual immortality; the Indian poet Kabir adds that the search for God has urgency. This is a phenomenon of today's busy life where little value is given to spirituality and contemplation. This slow movement has two parts and a largely tonal structure. The low instrumentation represents the darkness of the forest and the lure of inertia. The third movement is of a chamber music character and a poem Amir “ Khusro” (1253–1325) has been used. Noteworthy for this tradition of Sufi poetry coming from a Muslim background of the 13th century is the metaphoric imagery of a female image of God; this would be unthinkable in today's times. Is God a woman? The rhythm is in 7/8 and varies in a cycle of quadruplets and quintuplets; this complex rhythm is often used in percussion traditions of Northern India. Here, the tonality changes between an A minor chord which is augmented through chromatic movement, and an irregular pentatonic scale. “Meera” (1498–1547), the poet of the fourth movement says that spirituality and sensuality are in no way contradictory and this idea was also anchored in the Christian tradition of Middle Age Europe. However, the world of today has taken a step backwards as far as this is concerned. Meera’s devo-tional ecstasy and physical agony is reflected in the music. The rhythm of this movement is based on Indian folk rhythms which are played not only by the percussionists, but also by the lower strings. The tonality ranges from a clear A♭ major to an augmented C with an additional dominant seventh. Disconcerting harmonies represent Meera’s torments and longings which finally find salvation on the heavenly bed of the groom/God. Prayer Flags is a musical journey into the realm of spirituality, love and longing. The mystical relation-ship of a lover and his beloved where divine love embraces creation and the depths of the human soul are touched. The journey is full of inner torment; but in this desperation and fear something transcends the human understanding and the seeker is transformed. His identity merges with God and leads him from duality to unity. Our world is on the brink of self-destruction and there is an urgent need for introspection and reflection to find peace. This symphony reflects the longing for this inner peace and harmony in a world full of turmoil and upheaval.